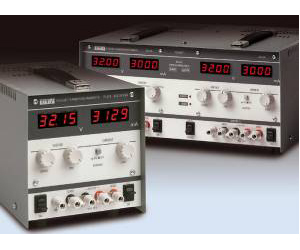 The Thurlby Thandar PL-P series offers a high performance fully programmable power supply system at low cost. Based around the 32V-3A versions of the standard PL series, the PL-P models include single, dual and triple output units suitable for bench or rack mounting. When not connected to the bus, these PSUs can be operated exactly as a standard PL series PSU. Each output is fully floating and is opto-isolated from the bus interfaces. Outputs can be linked in series or parallel to produce higher voltages or higher currents as required. PL-P series supplies use simple and consistent command structures which make programming particularly easy regardless of which interface is used. A National Instruments LabWindows* device driver is available as an option. LabWindows is a trademark of National Instruments Corporation. ARC stands for “Addressable RS-232 Chain” and is a low-cost system for linking instruments together so that they can be controlled and monitored by a personal computer. The ARC interface is an extension of the industry standard RS-232 interface and is exclusive to Thurlby-Thandar instruments. It differs from conventional RS-232 in that it allows multiple instruments (up to 32) to be controlled using the normal RS-232 or RS-422/423 port of a PC.